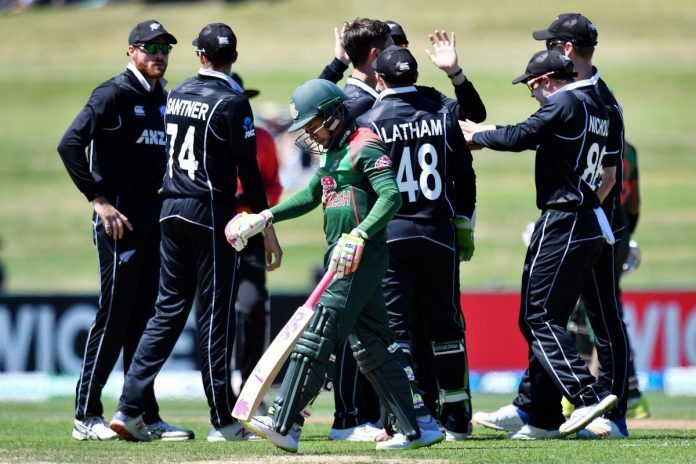 Tigers have started the three-match ODI series against New Zealand with a 8-wicket defeat in the first match of the series at McLean Park, Napier. Second ODI of the series will be held on February 16 at Christchurch. After opting to bat first, Bangladesh were in big trouble after losing 4 top order batsmen for only 42. Soumya Sarkar played a cameo of 30 off 22 balls but failed to convert it to a big innings. Mahmudullah and Sabbir Rahman too got out cheaply before the 100 rans mark. On the other end, Mohammad Mithun played an gritty knock of 62 off 90 balls to guide Bangladesh to a total of 232. Along the way, Mithun added record 84 runs in the 8th wicket stand with Saifuddin who contributed a valuable 41 off 58 balls. Trent Boult and Mitchell Santner shared 3 wickets each for the Blackcaps. In reply, Martin Guptill and Henry Nicholls made an 103-run stand to frustrate the Bangladesh bowlers. Mehidy Hasan finally broke the partnership with the wicket of Henry on 53. Couple of overs later, Mahmudullah trapped Kane Williamson for 11. But Guptill gave no chance to the bowlers as he picked up his 15th century to help New Zealand winning the match comfortably with 8 wickets and 5.3 overs left. Guptill was unbeaten on 117 and his partner Ross Taylor was on 45. Miraz and Mahmudullah took one wicket each for Bangladesh.